This is the PDF Download only Version. Pick-Up-Sticks is a Fat 8th Friendly Design. It measures 56" X 60" and is a great quilt in any fabrics, kids, brights, batiks or reproductions. A Bonus pattern is included called Four Square 61" X 61". Four Square quilt pattern uses the scraps and leftovers from the first quilt. Just some additional yardage is needed for the sashing, border, and binding. An additional pattern for a "Binkie" quilt is also included. " Binkie Quilts are small scrap quilts I make which use up the fabric leftovers. They are small quilts for kids to have in their stroller, for nap time, for dragging around or chewing on! 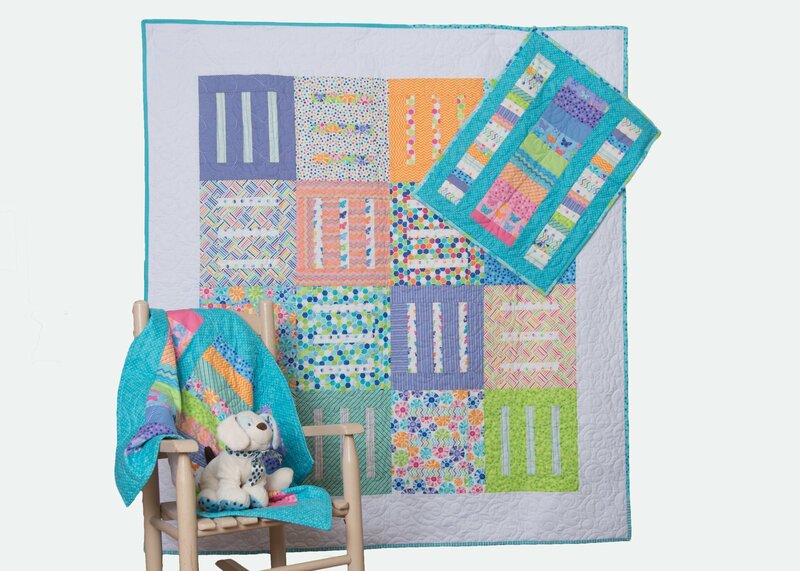 So this pattern, with a Fat 8th Bundle and yardage you can complete at least 3 quilts. This is a basic, simple quilt design for all levels of quilters. A beginner with some experience with rotary cutting and piecing will enjoy the very descriptive pattern with diagrams for each step in the process. More experienced quilters will enjoy the simple and versatile design, with quick results.